"All nations welcome except Carrie," reads a sign behind the bar. 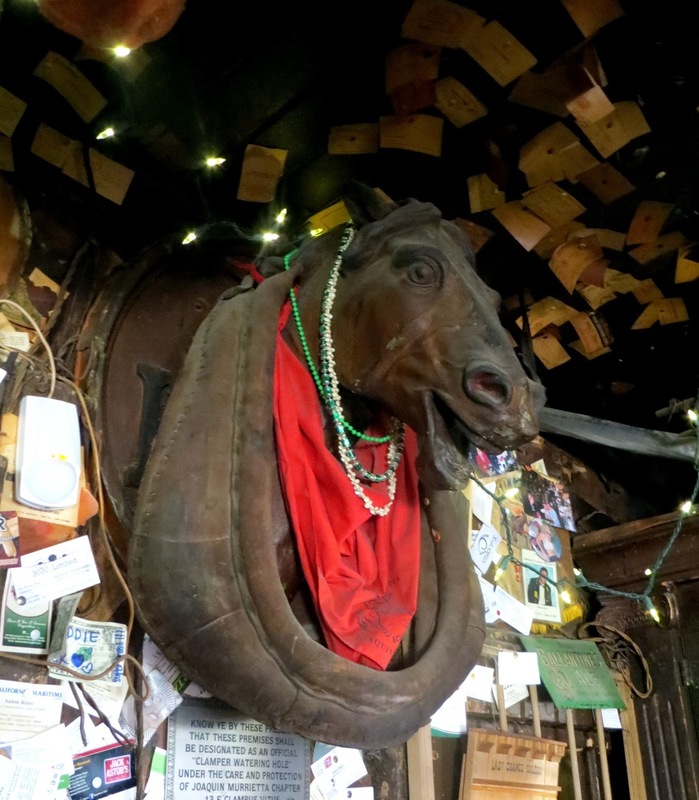 It's not common for the witticisms that pepper the walls of bars to include puns at the expense of people who died over a century ago, but Heinold's has been here since 1883. That's when Johnny Heinold purchased the building of old whaling ship timbers that had provided bunks for men working the oyster beds, and turned it into the J.M. 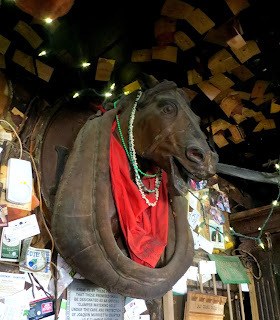 Heinold Saloon. 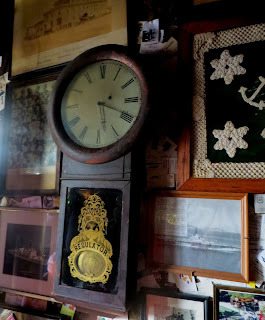 It survived both prohibition and the great earthquake of 1906, though the latter left damage to the pilings below that give the mahogany bar and wood floor a sharp tilt, and to a clock famously stopped at 5:18am, ever since that April morning. 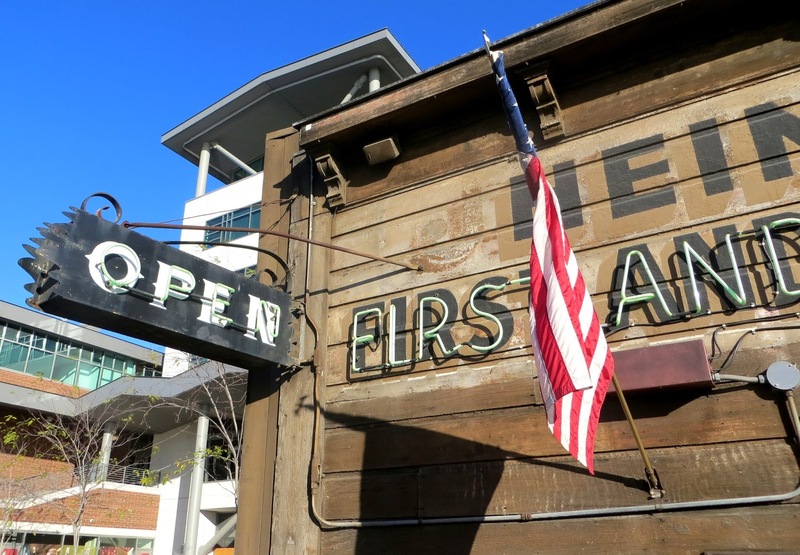 The surname was eventually appended with "First and Last Chance" based not only on the navy men and other seafarers catching a last drink before going to sea, but also for the workers riding the old ferry between Oakland and the dry city of Alameda. 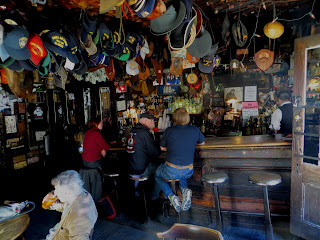 The bar has hosted President Taft, Ambrose Bierce, Erskine Caldwell, and, most famously, Jack London, who once sat reading the dictionary at the table by the door, before featuring the bar in his novel John Barleycorn, and compiling notes used for The Sea Wolf and Call of the Wild. 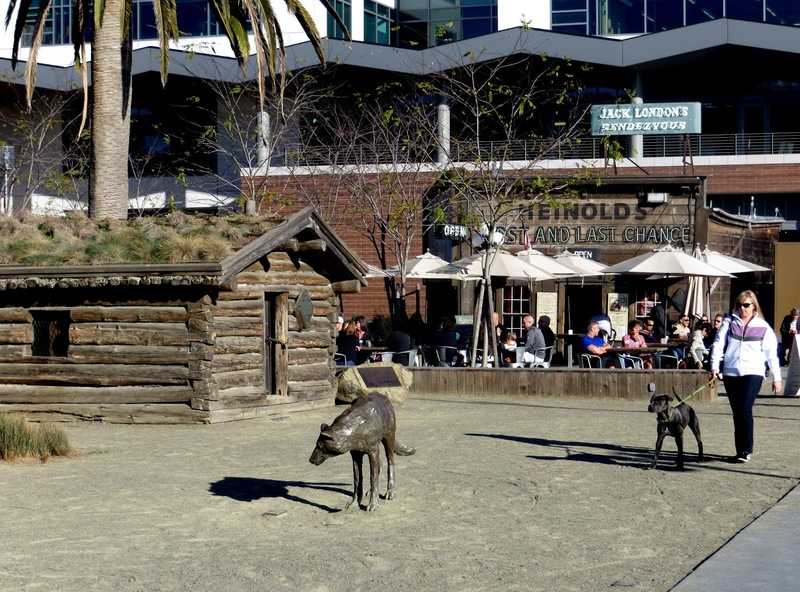 Now London's Klondike cabin sits nearby the old wood bar, both surrounded by the bright, neat, and touristy Jack London Square, like two neanderthal scenes in a modern museum. 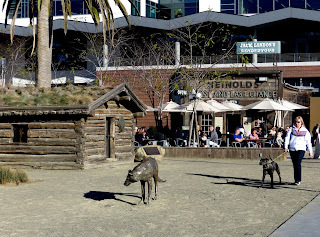 Despite the preciousness of the setting, Heinold's feels reasonably intimate and relaxed inside on this day, aware of its history certainly, but feeling enough like a neighborhood bar that one doesn't feel like you're taking your turn in a Disney exhibit. The drinks are limited to a small but reasonable selection of beers and standard spirits -- you wouldn't want anything more at a classic like this. The limited ceiling and wall spaces are crammed with memorabilia, along with the stove-blackened dollar bills and business cards of various generations of men heading off to sea and/or to military service. 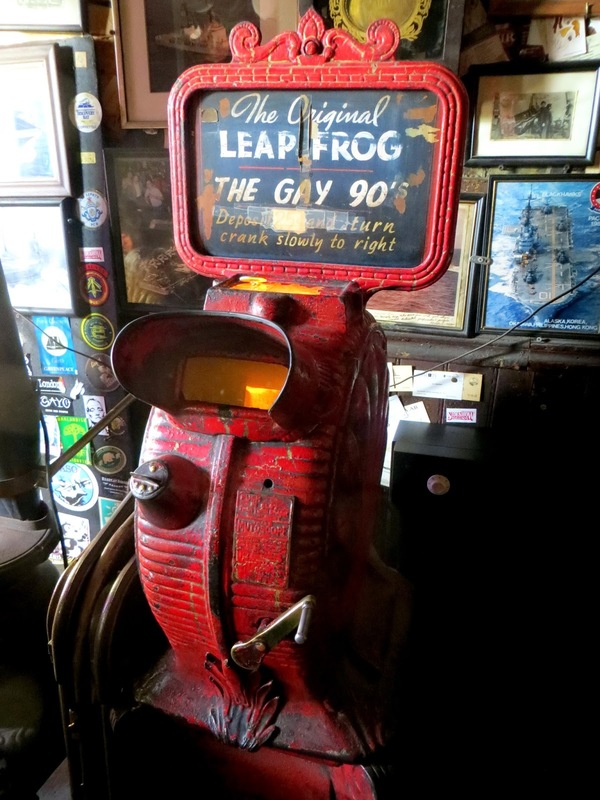 The original potbellied stove remains the only source of heat, and it is the last commercial building in California retaining original gas lighting. 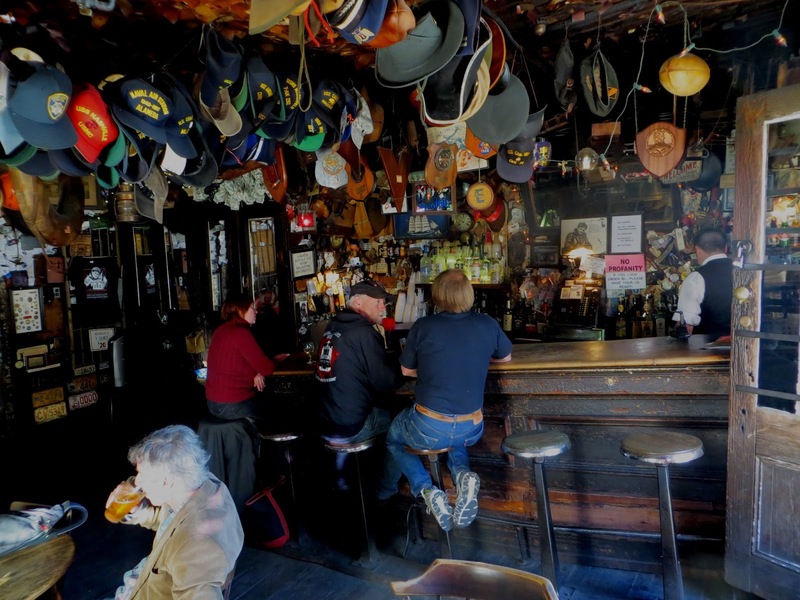 It would, of course, be a grave sin to move the bar from its historic location and cherished uneven pilings, but it is pleasing for me to imagine trundling into this place some dark evening through several inches of snow.